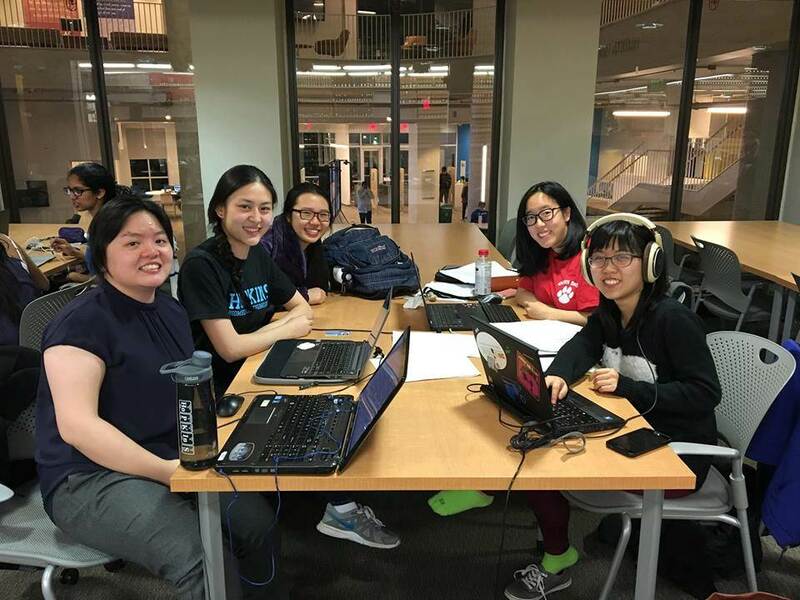 The Institute for Computational Medicine is proud to offer an Undergraduate Minor in Computational Medicine, the first educational program in CM, reflecting Johns Hopkins University’s leadership in this field. Like the ICM itself, the Undergraduate Minor in Computational Medicine is integrative and multidisciplinary. The ICM Core Faculty who serve as advisors to the Undergraduate Minor in Computational Medicine hold primary and joint appointments in multiple Johns Hopkins University departments and schools including Biomedical Engineering, Computer Science, Electrical and Computer Engineering, Mechanical Engineering, Applied Mathematics and Statistics (WSE); Neurosurgery, Emergency Medicine, Medicine, and the Divisions of Cardiology and Health Sciences Informatics (SOM); and Health Policy and Management (BSPH). Undergraduates who are interested in learning about the Minor in Computational Medicine are encouraged to attend the ICM’s annual Computational Medicine Night. Undergraduates who would like to begin the minor declaration process should complete the CM Minor Prospective Students Form. Click here to view a PDF of a sample curricula by major. What will I gain from a minor in CM? With a minor in CM, students will have a solid grounding in the development and application of computational methods in multiple key areas of medicine. Specifically, they will understand how mathematical models can be constructed from biophysical laws or experimental data, and how predictions from these models facilitate diagnosis and treatment of a disease. Graduating students will be conversant with a wide variety of statistical, deterministic and stochastic modeling methods. They will be able to develop a model and to write code to implement it; they will be able to analyze and visualize the resulting data from the simulations. These skills are essential to the advancement of modern medicine, and are prized both in academic research and industrial research. The courses and research opportunities available in the CM minor will place students at the forefront of the application of mathematics, computing and engineering to human health. Whether you go on to medical school, graduate research, or biomedical industries, the comprehensive quantitative training and exposure to cutting edge CM techniques will give you a competitive advantage for working in the medicine of tomorrow – which will be data-driven, predictive, personalized and preventative. Will I have opportunities to specialize within CM? Computational Physiological Medicine develops mechanistic models of biological systems in disease, and applies the insights gained from these models to develop improved diagnostics and therapies. Therapies could be diverse drugs, electrical stimulation, mechanical support devices and more. Computational Molecular Medicine harnesses the enormous amount of disease-relevant data produced by next-generation sequencing, microarray and proteomic experiments of large patient cohorts, using statistical models to identify the drivers of disease and the susceptible links in disease networks. Computational Anatomical Medicine uses medical imaging to analyze the variation in structure of human organs in health and disease. Such image analysis has been integrated into clinical workflows to assist in the diagnosis and prognosis of complex diseases. Computational Healthcare is an emerging field devoted to understanding populations of patients and their interaction with all aspects of the healthcare process. Techniques for and applications in each of these four key subareas will be introduced in the required core courses, so that students will be exposed to the breadth of Computational Medicine, and will be able to identify preferred areas of interest. What are the prerequisites for the minor? Probability and Statistics: either a single course covering both (e.g. 553.310 or 553.311), or a course devoted to each (e.g. 553.420 and 553.430) – this may be taken concurrent with Introduction to Computational Medicine (see below). What are the core classes needed for the minor? Systems Pharmacology & Personalized Medicine (EN.580.430). EN.580.431 covers computational anatomy and physiology and will be jointly taught by ICM faculty from multiple departments. EN.580.464 covers the basics of data science in biomedical engineering and requires proficiency in basic programming in at least one language, basic calculus, and linear algebra . EN.580.488 introduces probabilistic modeling and information theory applied to biological sequence analysis and EN.580.430 focuses on the applications of pharmacokinetics and pharmacodynamics to simulating the effects of various drugs across a heterogeneous population of diseased individuals. Both EN.580.488 and EN.580.430 require a background in linear algebra, differential equations, probability, and statistics. Am I required to attend ICM seminars? In addition to the elective requirements, students with a declared Computational Medicine minor are REQUIRED to attend no less than 6 ICM Distinguished Seminars in person prior to graduation. Documentation of seminar attendance is two-fold: (1) Students must sign-in at every seminar attended and (2) students must complete the online Seminar Attendance Form. Please note that undergraduates do not need to register for the Distinguished Seminar Series in Computational Medicine course (EN.580.736/7) but do need to attend six ICM seminars and document their attendance to graduate with a Computational Medicine minor. More information on seminar speakers, dates, and topics can be found here. What are the elective requirements for the minor? No more than 3 of the 18 elective credits can consist of independent research in computational medicine or approved CM-related research. The Senior Design Project Course (EN.580.580/581) may count toward independent research, provided that the research falls within the field of computational medicine, as decided by the advisor. Eligibility of independent research as “M”, “C”, “MC”, or neither is at the advisor’s discretion. All 18 credits will all be at 300-level or above. At least 2 non-core courses must have a substantial biology or medicine component, as identified in the list below with an “M” designation. At least 1 non-core course must have a significant component of “applied programming” (distinct from a course on computer language or on programming such as Intermediate Computer Programming in Computer Science) to satisfy the computational component, as identified in the list of electives with an “C” designation. All courses must be passed at a C- level or above. A class may not be counted as both a prerequisite and an elective. Students may suggest elective courses to be added to the list by completing the “Class Approval Request Form”. Requests should be made to Alecia Flynn (aflynn12@jhu.edu) and will be reviewed by the CM Minor Curriculum Committee. *May be used to satisfy “C” or “M” requirement but not both. Specific questions regarding the minor can be directed to Alecia Flynn, Academic Coordinator for ICM.